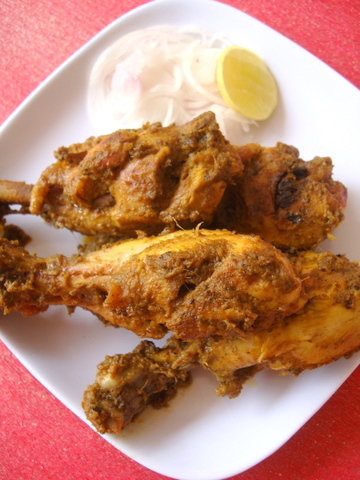 I usually make this roast recipe using chicken legs and Nehal is extremely fond of it. Few spices go into its making and ensure you marinate the chicken for at least 3-4 hrs if not overnight and roast the chicken well. You can play around with the spices of your choice and add herbs like mint and rosemary. 1 Marinate chicken legs with all the above ingredients except oil. Refrigerate and allow to marinate overnight or marinate for at least 3-4 hrs. 2 Heat oil in cooking vessel, add curry leaves and chicken pieces along with the left over marinade if any. Cook on high for 3 mts, reduce flame to medium, place lid and cook for 10 mts. Reduce flame to low and cook for another 10 mts. 3 Remove lid and cook till the water evaporates and roast on medium flame till well cooked. Serve warm with onion slices and lemon wedges. Perfect roast that I would love to have with curd rice. Looks very spicy and tempting. Dish looks yummmy and I do want to try it but have one question and I will be glad if u reply..
can I use whole chicekn??? It looks yummy and mouthwatering. Love spicy chicken legs. Nice recipe. Hi Sailu….I made it today and followed all the instruction, except i used a barbecue to cook the same. I was told by hubby that the masalas did not get into the inner part of the chicken. I have no idea, but i did make a lot of slits and marinated overnight. Please help as i have left over chicken for Wednesday evening. Add more yogurt if necessary and place in a zip lock bag. And shake the bag so that all sides get enough sitting time in the marinade. Thanks Sailu for your reply. To tell you frankly the 4 pieces of chicken were totally soaked in the yogurt. Dont know what went wrong. I hope you used chicken with bone or chicken legs and not the breast pieces. If you do not have that sauce, you can add tomato sauce and red chilli sauce, Sarita. Hai Sailaja garu…ur recipes r awesome…keep up ur work..
Hi I tried this recipe and its awesome. thank you.. keep updating new new recipes. thnq..
hi.. lemme say a very big thanx for ur recipe, ‘coz it was really yummy. my guests also had a nice deal with that dish. fantastic. may god bless u. Thanks for the wonderful recipie Sailu garu. I tried this yesterday night. I tried this recipe of yours today and it turned out very tasty :). Lookiong forward for ur reply. I am a newly turned vegetarian — can i make this without the chicken?? I know & love the taste of the masalas but want to make a veg thingy…will paneer/potato do? You can try a mixed vegetable curry. Ensure you saute the veggies in a bit of ghee or butter for a rich flavor. You can even try paneer. 1) Are chicken legs the same as drumsticks? 2) Do you keep the skin on or do you remove? 2) You can keep the skin. I usually remove it though. Thank you so much for your prompt and helpful reply! I am in the middle of making it right now (the skinned drumsticks are marinating as we speak). When you say ‘roast on a medium flame’ — are we still talking about while the chicken is in the pot– or should be remove the chicken from the pot and actually put the chicken directly on the flames? Apologies if this is a silly question. Thank you. Will let you know how it goes. Its not a silly question. 🙂 Cook it on the pot over medium flame, not directly over the fire. Hi Sailu– just wanted to say the chicken came out excellently. I don’t think I made the slits in the chicken big enough, as the chicken hadn’t fully absorbed the taste of the marinade– but that is easily rectified. An amazing recipe. Thank you. Can we do this without yoghurt becos of dairy allergy..?Thanks for the reply. Yes, you can. Omit yogurt and use lemon juice. Can we do this without yoghurt/Buttermilk becos of dairy allergy..?Thanks for the reply. Tried this dish. Turned out exactly the same in the appearance and very tasty too. Will be making it a regular Sunday evening dry eat. Thank you. Frozen will never taste fresh. Hi Sailu…have tried this recipe on a couple of occasions and have to tell you this, the best of cooks have appreciated it . I recommend this recipe as a must try once. Thank you. I tried this dish and it just came out superb!thanks for posting this!! Hi Sailu, my family would love this! Especially if it’s as delectable as it looks….mmmm, yum. Thanks for another great recipe! I have commented earlier on this recipe and have specially gotten back here again to tell you that I have lost count of how many people who I had recommended this recipe to have gotten back to say their children /guests simply loved it!! Highly recommended recipe for all chicken lovers. Hi Sailu I just made this chicken for lunch and its amazing!!!! Thank you so much 🙂 I love your recipes…. Any substitute for the Hot & sweet tomato Chilli sauce?I want to make it for guests tomorrow.Don’t have time to get the sauce. Buy readymade hot and sweet tomato chili sauce. If not, use tomato ketchup, little sugar and green chili paste and dash of vinegar. Omit curd and use vinegar/lemon juice. Can I use boneless breast pieces in this recipe instead of the drumsticks. can u give a clear recipe for the ingredient ginger +gatli+green chilli paste, PLEEEEAAASE? ?